Special interest safaris in South Africa allow you to combine your safari adventure with one or more of your special interests or hobby's, enhancing your experience. These safaris are specially designed and often custom-made for those who have a specific interest that they want to pursue on their safari. Nowadays the word safari has taken on a much wider meaning, including tours and travels not necessarily related to the search and observation of wildlife only. In addition to the regular safari activities, special interest safaris in South Africa focus on one or more of a wide variety of other subjects such as Photography, Ballooning, Fishing, Mountain biking, Horse riding, Culture, water-based activities and adventure activities, depending on your desires and preferences. You can either choose a standard package or go for a customized and tailor-made option. A Golf safari tour for example wil allow you to combine your safari adventure with your passion for Golf by including in your safari itinerary visits to some of the most beautiful golf courses in the African bushveld. They are often situated adjacent to or inside game reserves and national wildlife parks. For those who pursue photography as a hobby, indulge yourself in creating the most beautiful pictures of stunning landscapes, awesome wildlife encounters and spectacular bird life to name but a few. Each picture a unique remembrance of a once in a lifetime experience. Experience the exotic and mysterious African culture as part of your safari itinerary. Visit the locals in their traditional villages and discover their customs and way of life. Attend a church service, visit a school, watch them dancing and singing around the camp fire and have a Sangoma or traditional healer throw hid bones for you. Discovering the African bushveld and its wildlife on horseback. Just imagine yourself cantering along with a pair of Giraffes, riding quietly in the midst of a herd of grazing Wildebeest or Zebra, or just standing on a ridge admiring the beauty of the African bushveld sunset. Normally the horses are well trained and adapted to feel at ease between the wildlife, which in turn usually ignore the horses, regarding them as part of their animal kingdom. That means that they are also part of the food chain, so be very careful. You have to feel comfortable riding a horse and have some experience before riding among the big game animals. Find the special interest safari in South Africa that best suits your interests, preferences and budget by comparing over 450 safari tours, over 500 specialized safari tour operators, over 50 national parks and game reserves and more than 200 user reviews. Compare more than 600 specialized safari tour operators with user reviews and ratings, comfort and luxury levels and area of specialization. Compare more than 40 wildlife parks and reserves with user reviews and ratings, travel guides and maps, wildlife and scenery evaluation. Compare more than 300 reviews about South Africa as a safari tour destination, including ratings on wildlife, scenic beauty, birding. Plus expert reviews. The Cape Eagle Owl (Bubo capensis). As a member of the larger species of the eagle-owl genus "Bubo", it is found all over the African continent on both sides of the Sahara, except for the rain forest belt. Although mostly found in hilly and mountainlike rocky areas, the The Cape-Eagle-Owl is at home in a wide variety of habitats, from sea level up to the snow line height. Being nocturnal, it is roosting during daytime, preferring spots such as rock crevices and sheltered rock ledges and sometimes even trees and dense bushes on the ground. Around breeding time male and female can be found roosting together. The Cape Eagle Owl (Bubo capensis). 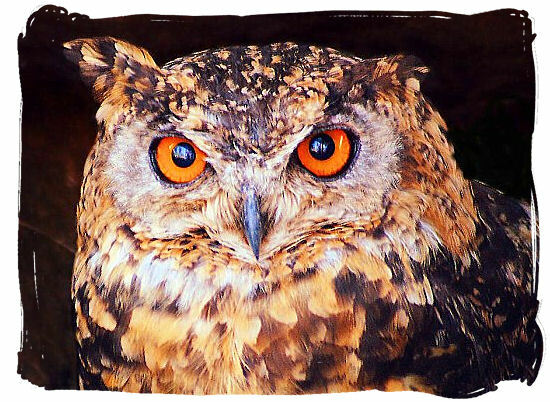 As a member of the larger species of the eagle-owl genus "Bubo", it is found all over the African continent on both sides of the Sahara, except for the rain forest belt. Although mostly found in hilly and mountain-like rocky areas, the The Cape-Eagle-Owl is at home in a wide variety of habitats, from sea level up to the snow line height. Being nocturnal, it is roosting during daytime, preferring spots such as rock crevices and sheltered rock ledges and sometimes even trees and dense bushes on the ground. Around breeding time male and female can be found roosting together. Play list comprising more than 70 short videos about the wild birds of South Africa. Although the videos only show a limited number of the 858 species that have been recorded, they are an excellent starting point for the bird lover who wants to know more about South Africa's bird life. If you love trains and especially steam trains, and you want to see the best of South Africa in luxury and romantic steam train style, then this type of safari is for you. There are a number of exciting special interest train safaris available in south Africa. They include opportunities to take pictures of steam locomotives, spend time on the foot plates, talk to train drives and stokers, smell the steam and coal and talk trains, trains, and more trains. Enjoy the luxury and romance of a steam train safari. 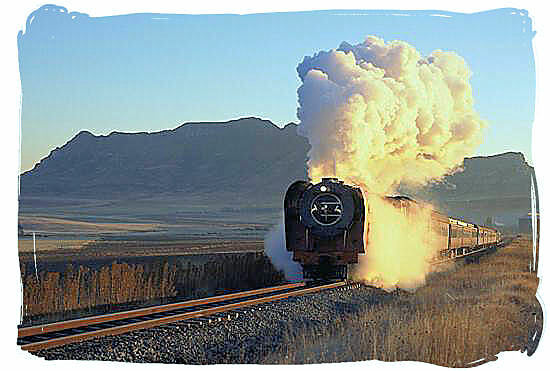 In South Africa the words "steam train safaris" are almost synonymous with the words "Rovos Rail", a private railway company operating 5 star train safaris to a variety of destinations in Southern Africa, including highlights such as Cape Town, Victoria Falls, Dar es Salaam and even Cairo. When you board the train and enter its world of luxurious and romantic elegance, you get the feeling that time has slipped away. It is the combination of the ambiance and romance of a bygone era and the mystery and magic of the African wilderness that makes it such an extraordinary experience. A short video about Rovos Rail, a private railway company in South Africa. "Regarded by the Society of International Railway Travelers as one of the top 25 luxury trains in the world, Rovos Rail offers a variety of journeys ranging from two nights to two weeks. Trains depart regularly from Rovos Rail Station in Pretoria for Cape Town, Durban and Victoria Falls with longer journeys operated on an annual basis. These include two golf itineraries, of nine days, each with delightful programs for non-golfers. There is another nine-day safari to Swakopmund in Namibia as well as the two-week adventure from Cape Town to Dar es Salaam". 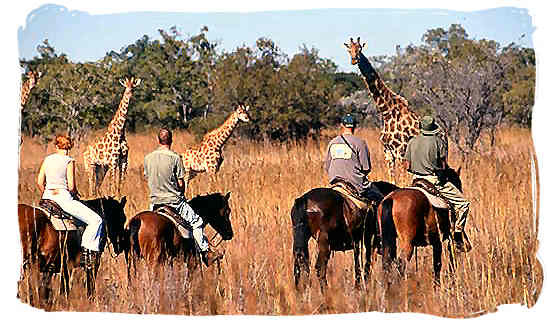 A very popular type of special interest safari in South Africa. Just imagine,... an exclusive bush camp, a private game viewing deck, a bottle of champagne in the ice bucket, the sounds of the bushveld and the grandeur of Africa spread all around you. And in the middle of it all just the two of you. Is there a better way to start your wedded life together than on a safari in South Africa? A honeymoon is one of the highlights of any couple's life. 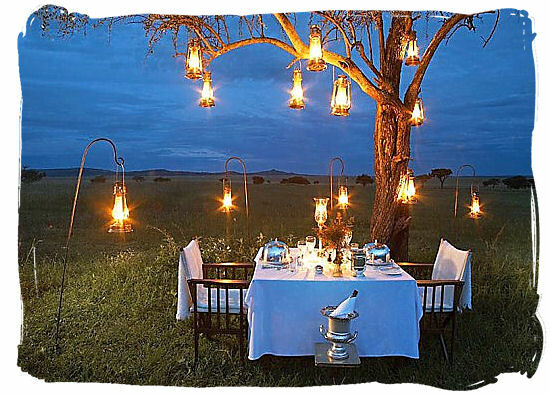 Just imagine the two of you together in the heart of the African wilderness, enjoying a candlelit romantic dinner for two after a day of breathtaking wildlife encounters amid awe-inspiring landscapes. You can make your honeymoon as modest or as luxurious as you wish. Whichever way you choose it to be, it will always remain one of the most magical experiences in your life. The following video is about a romantic honeymoon safari through wildlife, paradise beaches and cultural heritage. "The itinerary is designed as a private flight taking the honeymooners straight to their safari camp in Selous and then, few days later, to the paradise Fanjove Private Island, where they can relax and experience barefoot the most pristine beaches and marine life. Their private journey will then take them to Zanzibar for a cultural dive into the surprising beauty of Stone Town. A final hop to the lively Dar es Salaam closes the circle". Meet Jaws himself. 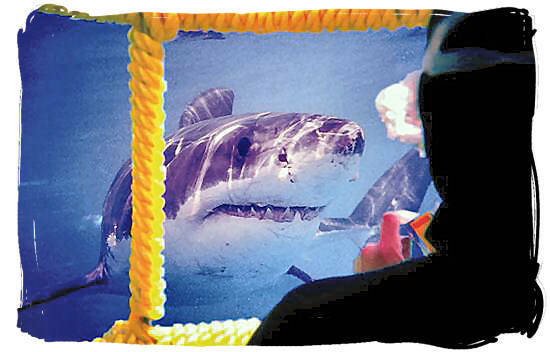 To go Great-White shark watching sounds terrifying, but they say it is an extraordinary experience and it is safe. Gansbaai is one of the places where you are almost guaranteed to see them. Those who are brave can be lowered in steel cages just below the surface of the sea, to watch these sea monsters rise up from the depths and go for the bait. Alternatively you can watch them from the boat. You will gain a new respect for these awesome creatures. Watch the awesome Great White shark from a cage just below the surface of the sea. The Great White is probably the most terrifying animal that can be found in the world's oceans. Certainly the most feared one. That is why getting into a shark diving cage to view them swimming around you within touching distance is a blood-curling experience that you will never ever forget. The cage usually hangs against the side of the boat. It is made from strong steel bars and is absolutely safe. You enter it at the top. Once you are inside, your head will be about half a meter below the surface. A step-up board will allow you to raise your head above the water so you can communicate with your guide and dive master. A short video about getting into the water (inside a cage) with the Great White sharks. This is what one of the participants said: "As a part of our tour of South Africa, we couldn't help but jump in the water with the Great White Sharks. Scary? Not really. If I were the seals on Dyer Island, then I'd be a little worried". 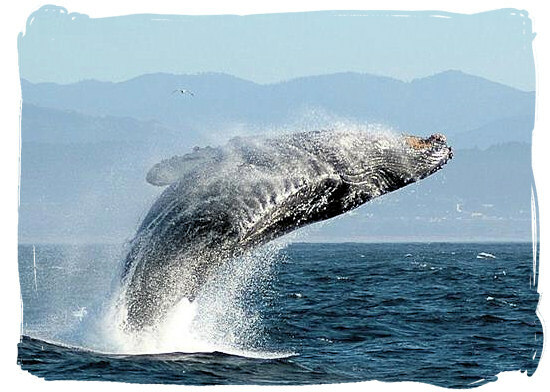 The period of June to November is the right time to go on a special interest whale watching safari in South Africa. It is during this period that the Southern Right and Humpback Whales leave their arctic feeding grounds in search of a warmer climate environment, to mate and calve. Large numbers of them congregate in the waters along the Cape south coast. In the middle of it all and overlooking Walker bay, lies the town of Hermanus, boasting to offer the best land-based whale watching in the world. 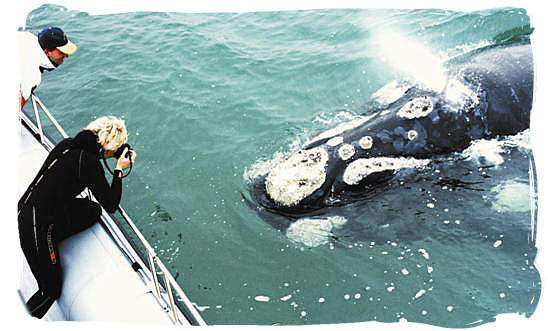 Other great whale watching hot spots along the Cape south coast are Plettenberg Bay, Algoa Bay and the Wild Coast. Eye to Eye encounter with a Southern Right whale. There is nothing that can prepare you for your first whale encounter. Imagine yourself sitting in a whale-watching boat and all of sudden this giant of the sea makes its appearance breaching the sea's surface in a massive display of graceful water aerobics driven by unrestricted power. This can consist of: Blowing, when the whale expels air through the blowhole often accompanied by a spout of water vapor. Breaching, when it breaks the surface in an arching back-flip. Lob-tailing, when it slaps its tail and flukes on the water surface. Spy hopping, when it rises its head and body vertically as high as possible above the surface. Short video of a whale watching boat tour. With some of the best land and boat based whale watching in the world, the coastline around Cape Town is a photographers dream. For an unforgettable day out, go on a trip with Dyer Island Cruises for the best chance of seeing whales, dolphins, sharks, seals and penguins all in one go.